Cranberry White Chocolate Shortbreads have a wonderfully rich and buttery flavor and are bursting with dried cranberries and chunks of white chocolate which give them a festive look for the holiday season. This cookie has a sandy texture which comes from adding both cornmeal and a little rice flour to the dough. While shortbreads can be made in various shapes and sizes, we will stick with tradition here and bake them in a round shape and then cut the round into wedges, called "petticoat tails". The name "petticoat tails" refers to the shape of the shortbread wedges which look like the bell-hoop petticoats worn by court ladies in the 12th century. As I said above, these Cranberry White Chocolate Shortbreads contain cornmeal, which is dried corn kernels that have been ground and comes in yellow, white or blue, depending on the type of corn used. The other ingredient in this shortbread recipe that you may not be familiar with is rice flour. Rice flour is a fine gluten-free flour produced from white or brown rice. It can be found in some grocery stores or else health food stores . If you cannot find it just substitute regular cornstarch (corn flour) for the rice flour. Also, try to use a good quality unsalted butter and pure vanilla extract, not imitation vanilla extract. The imitation vanilla extracts are made with synthetic vanilla (from glycoside found in the sapwood of certain conifers or from coal extracts) and leave a bitter after taste. Products labeled 'Vanilla Flavoring' are a combination of pure vanilla extract and imitation vanilla extract. I like to bake these shortbreads in a slow oven (around 300 degrees F) (150 degrees C) and the top of the shortbread is pierced with a fork before baking so it bakes evenly and you do not get air bubbles forming on the baked surface. Although, even with piercing the surface, you may still get some wrinkling but this is normal so do not worry about it. 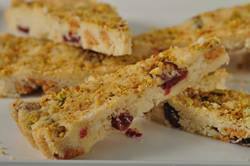 While not necessary, I often like to sprinkle the top of the shortbread with finely ground pistachios nuts before baking. This adds a nice color and flavor to the shortbread. Shortbread: Preheat oven to 300 degrees F (150 degrees C) and place the oven rack in the center of the oven. Have ready a 8 inch (20 cm) tart pan with a removable bottom. In the bowl of your electric mixer (or with a hand mixer), beat the butter and sugar until smooth (about 2 minutes). Beat in the vanilla extract. In a separate bowl whisk together the all purpose flour, cornmeal, rice flour, and salt. Add this mixture to the butter and sugar mixture and beat just until incorporated. Fold in the dried cranberries and white chocolate chips. Press the shortbread dough evenly into the tart pan. Prick the surface of the shortbread with a fork to prevent the shortbread from puffing up. Then, using a sharp knife, score (make shallow lines) the top of the shortbread into 12 even pieces. If desired, sprinkle the top of the shortbread with finely ground pistachio nuts. Place in the preheated oven and bake until the shortbread has turned a nice biscuit color, about 40 - 50 minutes. Transfer shortbread to a wire rack to cool for 5 to 10 minutes before removing from tart pan. Place the shortbread round on a cutting board and cut into 12 wedges (along the lines scored). Cool completely on a wire rack.